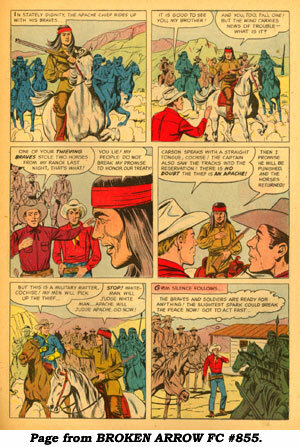 Dell was ‘King of the TV Cowboy Comic book Publishers.’ No other company even tried to compete, albeit Charlton who clicked with KIT CARSON and WILD BILL HICKOK. Dell signed up practically every TV western that came along. 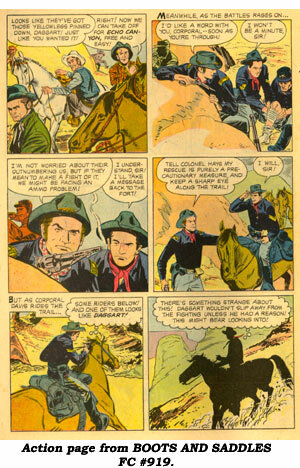 Throughout the years Dell licensed some 61 TV series for comic book adaptations, some (like GUNSMOKE, BONANZA, RANGE RIDER, MAVERICK) ran for 20 to 40 issues while less successful runs issued only from one to four comics via Dell. So, when we cover these short-run Dell TV western comic series, we’ll group three or four titles together for expediency. 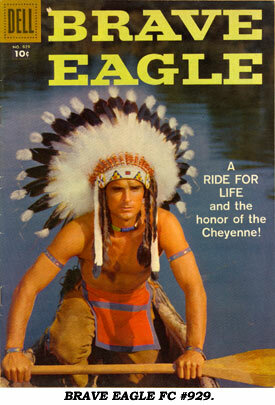 “Brave Eagle” starring Keith Larsen went on the air at CBS in September ‘55 and ran for 26 episodes through March ‘56. series had already ended original production and had gone into reruns. The second and third issues, Four Color #770 and #816, weren’t released until a year later, March ‘57 and June ‘57. Nearly another year passed before the 4th and 5th issues saw print, FC #879 in January ‘58 and FC #929 about September ‘58. All the artwork seems to be by Dan Spiegle, noted for the “Hopalong Cassidy” comic strip, then inked by someone unknown, however the artwork bore little resemblance to Keith Larsen. All five issues have specially posed gorgeous color covers of Keith Larsen, with b/w inside front cover photos in #879, #929. Several TV scripts were developed into comic stories. “Mask of the Manitou” (episode 7) and “Gold of Haunted Mountain” (episode 4) appeared in FC #705. “Shield of Honor” (episode 12) was in FC #770, and “Search For the Sun” (ep. 5) was in FC #816. All other stories were original to the comics. In Fine, FC #705 runs $24 with the other four issues costing around an inexpensive $12. 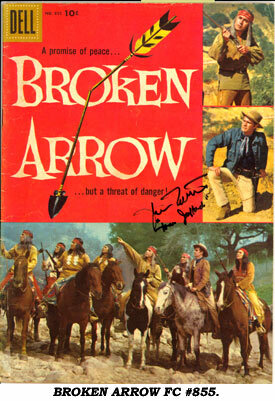 “Broken Arrow” with John Lupton and Michael Ansara was on ABC-TV from September ‘56 through June ‘58. Dell issued BROKEN ARROW as Four Color #855 in Oct./Nov. ‘57 with FC #947 a year later in Nov. ‘58. Artwork by unknown artists varied from issue to issue with none of it much resembling the two TV stars. The covers were not Dell’s usual specially posed covers, but were simply scenes from the TV show. More b/w scenes were on the inside front covers. (ep. 28) appearing in FC #947. Two other original stories were in FC #947. Both issues can be found in Fine for $18-$20. 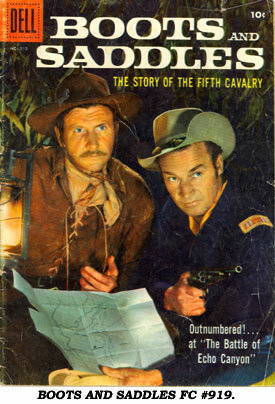 California National’s “Boots and Saddles” was a syndicated half-hour Cavalry series from September ‘57-May ‘58 for 36 episodes. The characters of John Pickard, Patrick McVey, John Alderson and Michael Hinn were the primary ones selected for the three Dell comic issues: FC #919 (July ‘58), FC #1029 (Sept. ‘59) and FC #1116 (Aug. ‘60). 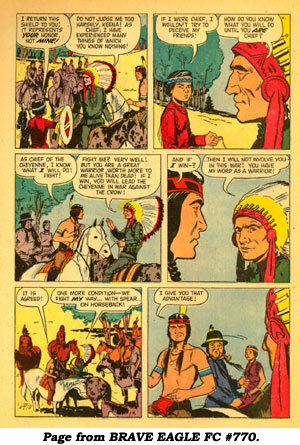 Like BRAVE EAGLE and other Dell series, the comicbooks unfortunately came out too late to really cash in on the original airings of the corresponding TV series. Prolific comic scripter Paul Newman wrote many of the BOOTS AND SADDLES stories. Artists varied from issue to issue; Albert Micale was one of those involved. At times the artists captured the essence of Pickard, Alderson and Hinn, at other times they did not. All three issues had posed photo covers of John Pickard and Michael Hinn with b/w scenes from the series on the inside front covers. All three can be found in Fine for $18-$20.